Welcome to the new Planet Nexus system, and congratulations! You've found the secret to the power of nexworking! Our New NexAds system is completely re-invented and rebuilt from the ground up to bring you more flexibility, more features, and more promotional potential. Give us a try! We couldn't be prouder of the new Nexus! We can't wait to hear your feedback as you explore our awesome control panel and start to implement your advertising options. You'll be enjoying feedback of your own, too, from our all-new visitor comments and ratings features. Get set to blast off! Facebook for websites! Amazing work! Great exposure and doesn't cost a penny! Sure, you could use Google Adwords, but do you really have a budget for that?! Sign up today and get your site's link out there! 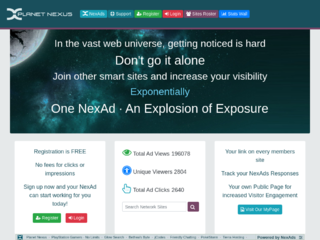 Click the rocket above to Boost Planet Nexus!